Offering support to business houses and industries alone will not offer satisfactory development of the nation. It is the responsibility of the central government to see that these private organizations don’t exploit the workers. For that, Indian law and constitution has several labor laws, which all companies have to abide by. The Union Labor and Employment Ministry looks after this sector. Recently, PM Modi launched a new portal that will offer better management and implementation of these laws. The name of this site is Shram Suvidha Portal. Preparing stable turf for business in India – Indian Labor Ministry is keeping no stone unturned to equip India to match up with the international business and industry standards. It is not possible in the industry and business managing system is flawed. It is here that the launch of this new portal will come in handy for business owners as well as central government. Safe-guarding sentiments of foreign investors – If the central government can eliminate errors and corruption from the labor laws and business law implementation system, then it will instill confidence in foreign investors as well. Simplification of online process – Digitization of registration and inspection reporting process will make it simple for all. The online formats are easy and eliminate any chance of human error. Proper labor inspection – All labor inspection related details will be uploaded on this portal and employers will also be able to register via this site. With access to this portal, employers will not have to worry about signing up for scheduling inspection. Transparency – Both Labor Ministry and Confederation of Indian Industry (CII) are positive that this portal will be able to rid the system of corruption. As everything will be on an open platform, the portal will play a vital role in bringing about transparency in inspection process. Pilot basis implementation – The portal will be run by the respective department on a pilot basis for the time being. Number of labor laws included – As the portal has been launched under pilot basis, central Labor Ministry has only included 16 labor laws for the time being. There are 4 such labor laws. If the portal produces satisfactory results, then those will be included in the portal in time. 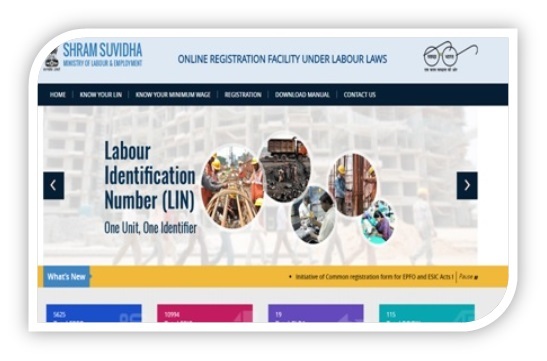 Online registration and ID allotment – This portal will make it easy for employers to get their Labour Identification Number. It is mandatory and without this number, they will not be able to complete legal business-related documentations. How to register on this portal? All individuals who are interested in registering on this new Labor portal will have to log on to its official site. For that, applicants need to click on the link shramsuvidha.gov.in. After clicking on this link, the home page of Shram Suvidha Portal will open up. If an applicant is desires to register afresh, he/she needs to click on the link marked as ‘Create A Shram Suvidha Account.’ This link is located in the same log in box. Once the person clicks on this link, a new page will open in a new tab. Here, he/she will get the online registration form. In this form, there are several options, and each has to be filled in with correct details. After typing in the name, middle name and surname, applicants need to provide their e-mail ID. Then he/she needs to type in the mobile number. It will complete the registration process. First and foremost, this portal will enable the central government department to allocate Labor Identification Number to organizations. It will be the responsibility of employers to log on to the official website and fill necessary forms. Only after this the department will offer a unique Labor Identification Number to respective employers. Then it will be responsibility of the Informing Agency to upload all details on this portal. It will be the duty of this department to update these figures regularly. Organizations will also be able to fill in tax return forms each year through this site itself. The portal has been launched recently. The central government will announce all updates in time. For the time being, this portal offers great news for business owners and industries.